Today is day five and it's the LAST DAY of our inspiration week with Xyron! I hope you have enjoyed our inspiration all week using Newton's Nook Designs products with Xyron adhesives on the NND blog and Xyron will be featuring projects as well on the Xyron facebook page! There are prizes too! Read all the way to the end of this post to find out how you can win! 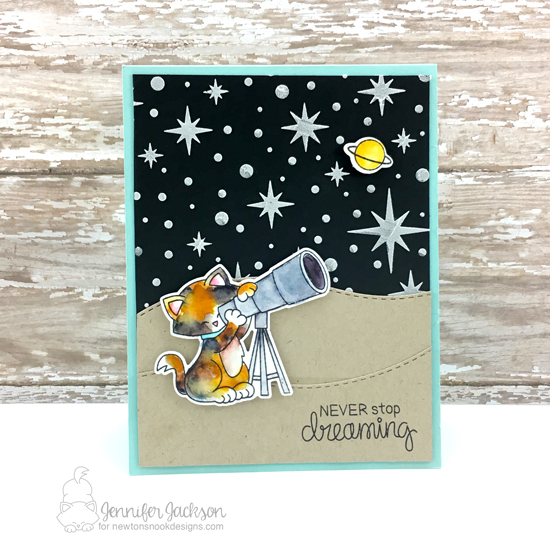 Today we are featuring projects by Larissa and Jen! 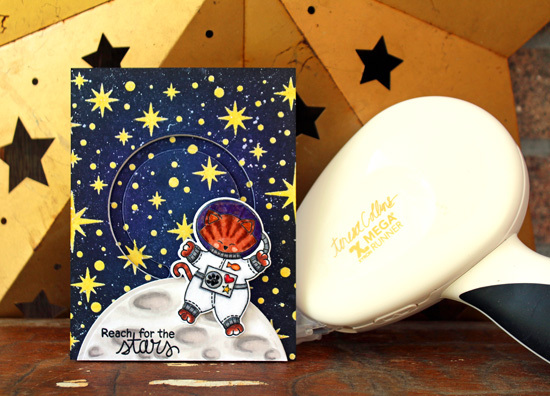 Larissa created this adorable card using our Cosmic Newton Stamp Set! She colored that cute image of Newton in a space suit and trimmed it out using the coordinating Cosmic Newton Die Set. Then she created an amazing background for him using the Starfield Stencil. She used the image of Newton and attached it to a spinner circle so the cute kitty can spin around in space! So cute! She used the Teresa Collins Mega Runner from Xyron to adhere her project together. Larissa and I must have been on the same wavelength when we created our cards for this week! I also used the Cosmic Newton Stamp Set to create my card. I used the image of Newton stargazing through his telescope for my project. I colored the image with watercolors and trimmed it out using the coordinating Cosmic Newton Die Set. I created a background using white embossing paste with the Starfield Stencil on black cardstock. Then I created hills using the Land Borders Die Set. The project was assembled using the Mega Runner from Xyron. Leave a comment on this blog today for a chance to win - details below! Love Newton as an astronaut and looking at the stars. Great coloring. So cute! Love Cosmic Newton! Great starry night skies! Both cards are fabulous AND fun! Love the spinner. I've made one so far & they are fun to make. And I really love the stenciled stars on Jen's card. So pretty! Fantastic cards, love the backgrounds! Wow! Fabulous cards!!! Love so much the space backgrounds!!! These are vset cute space themed cards. What a fun week filled with lots of awesome inspiration! Such cute cards! Love the newest release with all the fun stamps and STENCILS!!! Oh wonderful creation, this is one of my favorite set! The cards are fabulous but I can't see a CAT in real life enjoying being weightless in space. Of course, you never know with cats what they will enjoy! Wonderful backgrounds on these cards. Love them. ... and Newton in a STARring role! The stars are cute, Newton's adorable, very nice! I love Jen's coloring of Newton, it looks exactly like one of my cat. Both cards are awesome, with Newton and stars, it couldn't be different !!! Kitty in space 🚀 too cute!!!!! Love the starry skies! Adorable cards!